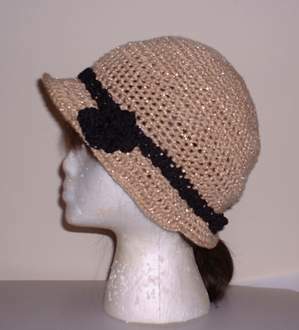 I've set up a mirror of this page at http://www.fmfcorp.com/familyspot/cloche-hat.html. It seems that there have been some link problems at this site. If you have any problems with this page, try the other site instead. As I am very new to crocheting, these are general instructions, rather than an exact pattern. Hopefully they'll be helpful anyway. Maybe some day I'll come back and count out stitches and figure out gauge and all those exciting goodies. Single crochet for about 15 stitches without increasing. Then switch to double crochet, increasing every 6 stitches. Switch back to single crochet, no increases for the last 15 stitches of the row. Continue rows in this pattern, but increasing every 7, 8, 9 and 10 stitches in the double crochet portion for 4 more rows. Then finish off with a row of single crochet, no increases all around. The rose came from a scrunchie pattern, again at CrochetPartners.com: Springtime Flowers Scrunchie The second one on the page. 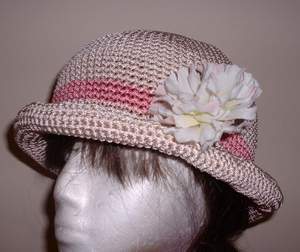 I attached it to a band of four single crochet across crocheted in the back loop only. 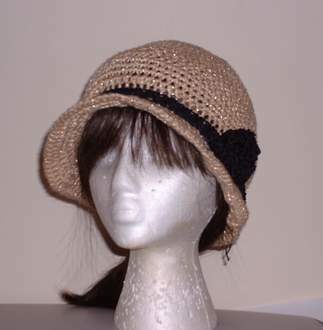 To make the hat fit snugly, I wove a strand of elastic cord through the last row before the brim (on the inside). If you make the band snug enough, this probably isn't necessary. To give the brim more shape I wove a length of thin wire (I got it from the jewelry section of the craft shop) through the final row of the brim. First row: Increase in every stitch all the way around. Row 8: Decrease in every stitch around. And I added a flower from the craft shop.